Cat Chat With Caren And Cody: Pet Product: The Auto-close Pet Gate from Primetime Petz Keeps the Doggy Out!! Pet Product: The Auto-close Pet Gate from Primetime Petz Keeps the Doggy Out!! Our home is a "bi-petual" household. We have a cat and a dog. Throughout most of my adult life I only had cats, when we added Dakota to our family I was faced with a few dilemmas. Our cat, Cody, was here first. He arrived three months before Dakota, his feeding spot was all set, his toys, cat litter, etc. all had their assigned spots. One of the dilemmas I was faced with was what will I do if Dakota and Cody do not get along? It was important to me to provide a safe haven for Cody where he could escape to for peace and quiet. Yet another possible problem was I read horror stories about pet owners not being aware that small cat toys that can easily be ingested by a dog, can cause MAJOR problems requiring surgery, and may even cause death. I KNEW that I had to keep Cody's toys AWAY from Dakota! "I won't eat any cat toys or cat poop, I promise!!" Dogs are also drawn to cat litter (and the "treats" that are in the box). Under no circumstances should either be ingested. It was a no-brainer that we had to have baby gates. 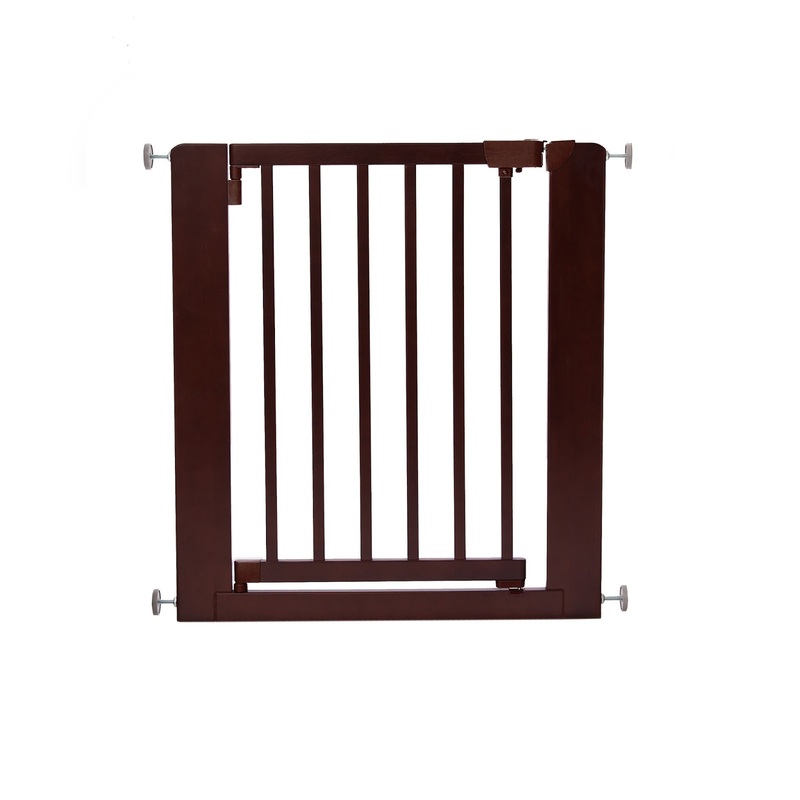 I searched everywhere for a gate that was practical, the perfect height, that was well-made and would suit our needs. Sadly, this is what we had to settle with for MANY years. I had three of these. They are BEYOND ugly. They served their purpose but accumulated every bit of filth known to man (and beast). When guests came over I had a nightmare. Some were able to climb over the gate, others couldn't, so I would be forced to remove it. Putting it back up when the guests would leave wasn't fun, and often the gate wasn't secure. Then there was the laundry! The gate in the above photo is right by our washer and dryer. I cannot begin to tell you the "fun" I would have, a mountain of laundry in my arms, trying to climb over an awkward baby gate. I am lucky I didn't fall flat on my face. To say it was annoying is a complete understatement! Last year I was reading one of my favorite websites, Hauspanther, written by founder Kate Benjamin, and saw a most beautiful and artsy gate that was made by Primetime Petz. I loved it! I have known Kate for many years, through her website, through her work with Jackson Galaxy, the Cat Lounge at BlogPaws, as well as her Hauspanther Collection which debuted on Primetime Petz last year. I left a comment and was ecstatic when Kate contacted me asking if I would like to review one of the Primetime Petz pet gates. Kate had me measure the opening in our hallway where I wanted the gate to be. Unfortunately, the original gate that I had my eye on wouldn't work, but Kate mentioned that the Primetime Petz new Auto-close Pet Gate would more than likely be perfect for our hallway. Our hallway is wider than the above gate, but thankfully the Auto-close Pet Gate comes with 2 frame extensions that only are used if needed. From Primetime Petz: The Auto-close Pet Gate, our own version of a swing-gate, is a functional and attractive tension-mount gate that easily attaches to doorways and hallways. Keep your pet safely contained to their designated area while providing you easy access to any space. It features a walk-through door which automatically swings shut and safely locks into place every time. Simply lift up on the door to disengage the lock and walk through. The gate takes care of the rest. The dual action locking mechanism provides superior security when not in use. It is made with beautiful hardwood construction and their signature Walnut finish compliments any decor! I also think it allows nosy Dakota to better see what is taking place in "Cat Land" where cat poop, cat litter and tiny toys reside. A mysterious place that he is not permitted to enter! Now this is where we experienced a SLIGHT (and I mean SLIGHT hiccup). I am not the person who installed the gate, nor was my husband. Neither of us are handy, so I enlisted the help of a dear friend who IS handy. I will NOT lie. When she first attempted to put the gate together she couldn't figure it out. I called Primetime Petz to tell them about our confusion. I am actually ecstatic that this happened because the help I received was SUPERB! The person I spoke to, went above and beyond. She emailed me step-by-step instructions that were crystal clear. (I did suggest that they have a video on their website that would better show how to install the gate because the directions included with the gate upon delivery ARE confusing, and she said they are working on that!). My friend was able to put the gate up and have it working in a half hour or so. I could NOT be happier with this gate!!! Doing laundry is a BREEZE.....I am ecstatic that I can open the door of the gate and step right through without worrying that I am going to fall. It is attractive and well-made. It is slightly taller than our previous gate. I was a little bit worried that Cody wouldn't be able to jump over it easily. I worried for nothing. Cody hesitated one or two times, then the same day, I heard/saw him jumping over the gate like a champ (and he is almost 10 years old). Did I mention that it is also darned attractive to look at? I am in love with the color and construction. When guests come over, the gate no longer has to be taken down, they can walk right through!!! PRIMETIME PETZ is the premiere designer and manufacturer of unique furniture-quality, all-wooden pet gates, kennels, and steps. Their products are made of 100% rich, beautifully finished, chew-resistant, hard wood that will compliment any decor. Their goal is to provide superior quality pet furniture that pets will enjoy and pet owners will feel proud to display in their home. Their collection features a variety of gates that offer solutions to almost any containment challenge. Their commitment to quality is unparalleled in the pet industry and they have made it their mission to provide you with cutting-edge designs that combine elegance and function for both you and your pet. And...their CUSTOMER SERVICE IS SUPERB!! If you are looking for a pet gate, The Auto-close Pet Gate from Primetime Petz should definitely be on your list! Dakota's plans to visit "Cat Land" have been attractively thwarted! In full disclosure: I received no compensation for this review. I was sent an Auto-close Pet Gate from Primetime Petz in exchange for my always honest review. That really is a very nice looking gate! So sorry to hear you keep the dog out, we thought gates were to keep cats out! We have some gated areas with small cat doors in them which works too. Your gate is real nice looking. We have a tension-mounted gate (though not as attractive as this one!) that also has a little door you can open/close to let the cats go through while still keeping the dog out. This worked great until Layla (dog) learned she could jump over the gate! that is one reason I am glad we never had Dakota in agility! lol. He COULD have jumped over our original gate....agility or no agility (he never realized he could). I am not so sure he could jump over this one because it is a little taller. I saw these at Global and loved them and wished I'd had one while Merlin was alive. Regular ones are not attractive but thees are. That's a VERY nice looking gate and perfect solution to the "I can't step over that hideous thing in the hall" problem!!!! We have neighbors who have a dog that isn't allowed in all rooms and for us at age 70+, getting over the gates is problematic at best! This is perfect.....I'll be mentioning this to them for sure. That is such a nice looking and problem solving gate. Great review! You were smart to thing of these things. Many don't and pay dearly. Our household is also "bi-petual" - and we've used a very similar gate like this. That is a nice gate, I could have sued it back when we had a dog- she was always stealing snacks from the litter box. Wow. That gate is absolutely gorgeous! I only have Bear ... but I will definitely keep this in mind. wish they had one for kitties. They leap tall buildings in a single bound. That is a very attractive gate! Our Mama loves it! It would, however, never work here...Wilhelmina would clear it in a single bound as would Duffy! Yup. They are both part gazelle. We use a babygate when a friend brings her dog over who can still have accidents inside the house in order to contain her to a rug free area (where we are as well!) and D + W spend the evening jumping the gate. Thankfully our friend's dog does not!! We have to use gates at our house, since a certain pup sometimes just cannot say no to the kitty food. This gate here looks fantastic, and now I think an upgrade in our gate system might very well be in store soon. Thank you for sharing this with us, Cody, Dakota, and Caren! We used to have those ugly plastic gates too - oh, I hated those things! We upgraded to the metal we have now, but they are still not nearly as pretty as these wooden ones - they are so nice! The auto close feature sounds really great too. I did not realize that people with cat and dog need it. It's something almost impossible to install in a house. I like the gate and it is perfect for keeping dogs out. Cats are too smart and agile, they would just jump over it. LOL! I hope you are having a great weekend. That is a stylish doggy gate and a great way to keep "someone" from unauthorized snacking! this is a great piece of news! I plan to get a dog someday and this may come in handy! Do Dakota and Cody get along now? Thanks! Yep they have gotten along since day one. Cody hissed at him once, only once (when Dakota first arrived), Cody laid down the law and has never hissed at him again. I was blessed. I didn't do any separating of them or anything. I just made sure they had each other's scent before Dakota came and I left Dakota in his crate for about a half hour so that Cody could walk around and look at him and sniff him. I was quite lucky!!! They are the best of friends. Shelties are known for being really good with cats though and Cody is friendly to everyone. That looks like a great gate and Dakota is so cute! That's a very good looking gate. I glad you found such an attractive solution to the bi-petual dilemma! That is a good looking gate! Does Cody drag toys around? Schooner takes his toys everywhere (he carries them in his mouth). They would definitely not stay on one side of the gate or another here. Thankfully, Choppy has no interest in anything of Schooners, except his food (and even then, he doesn't what Schooner's regular food, just his treats). sometimes Cody will carry a toy around, but thankfully not too far usually. But...there HAVE been a few times with the old gate that Cody brought his small catnip mouse to the gate. I am a little worried about that. The old gate the mouse couldn't fit through, but with this one it easily could. I do think Dakota might try to eat it because he is nuts lol!! Dog-guy used to try and eat/destroy kitty toys but now he just sniffs them and ambles off. His cousin...(RIP)...was a snatcher of all the mousie type toys when he was here, so they all had to be guarded carefully...and he did almost choke on one once...scary time that was. he biggest issue here it the litter box and yummy croquettes in there, MOL! That is a beautiful gate.